"The Purrington Power Sprayer was built in Wakefield by E.I. Purrington, Machinist, in his shop on Centre Street (near Main Street.) The sprayer was used for pest control and tree spraying, as well as for the spraying of gypsy moths. The machine was horse-drawn, with the driver seated at the top. 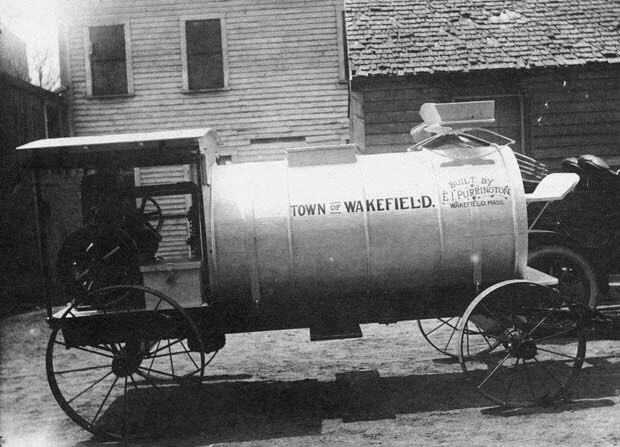 The machine was used not only in Wakefield, but in area communities by individuals who were hired to spray. In addition to the Power Sprayer, Mr. Purrington's newspaper advertisement showed he was a 'jack-of-all-trades': 'automobiles, gas engines and machinery, bought, sold and repaired, pattern and model making, machine work of all kinds in wood or metal.' He also built many homes in Wakefield." -- Text from calendar by Jayne M. D'Onofrio. Photo courtesy of Mr. and Mrs. Clarence Purrington. “Purrington Power Sprayer, circa 1900,” NOBLE Digital Heritage, accessed April 22, 2019, https://digitalheritage.noblenet.org/noble/items/show/7062.